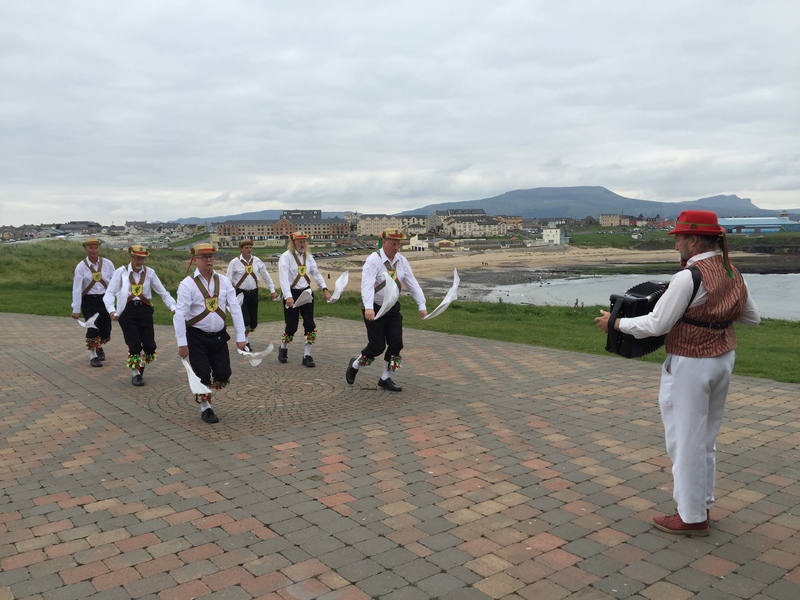 The Roguey Walk is synonymous with Bundoran and tourism for many years and indeed plays an important part in the history of the town from the Fairy Bridges to the World War 2 crash memorial to Aughrus Point to the “Dancing by the Sea” location. 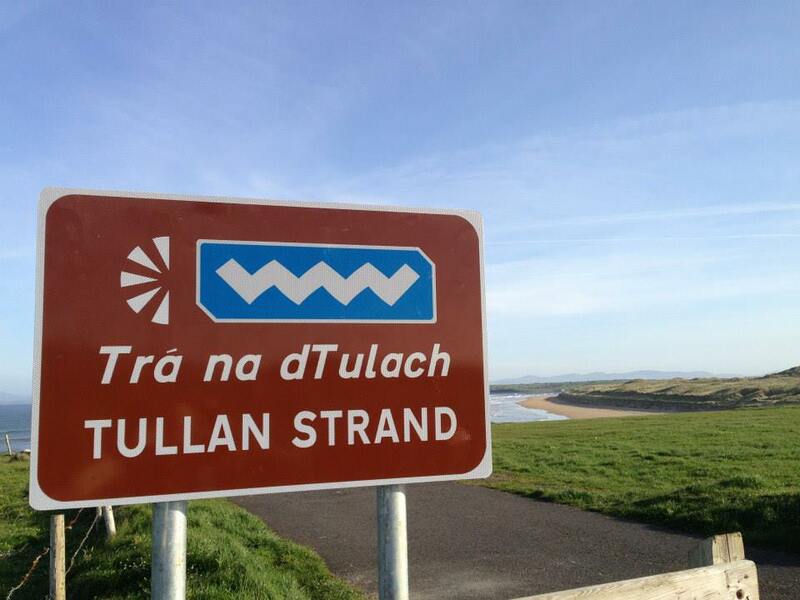 Tullan Strand, at the start of the Roguey Walk, is Bundoran’s Discovery Point on the Wild Atlantic Way – the longest coastal driving route in the world which stretches 2,500km from Malin Head in north Donegal to Old Kinsale Head in County Cork. 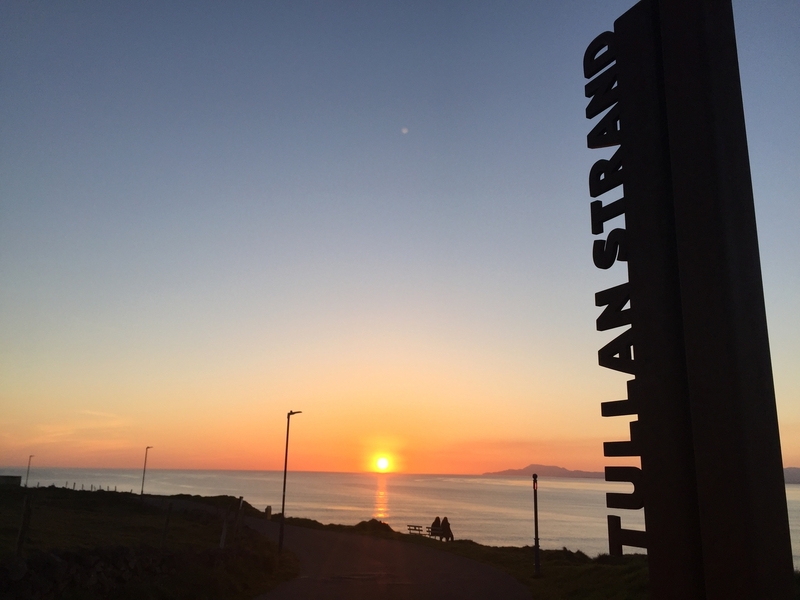 If you have purchased your Wild Atlantic Way passport, you can get it stamped at Bundoran Post Office for the Tullan Strand Discovery Point. At the tip of Rougey is Aughrus (the peninsula of the steeds), where the war horses of Conall Gulban and the O’ Donnells grazed. 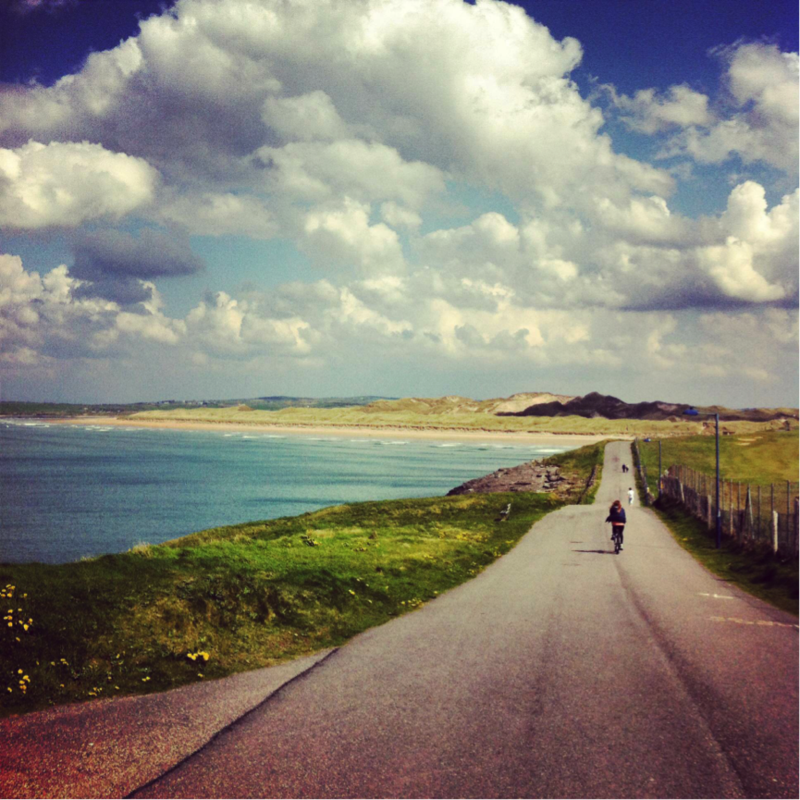 Below are the iconic rocks of Rougey which contain Bundoran’s oldest inhabitants. The coral and brachiopod fossils embedded there are over 300 million years old. 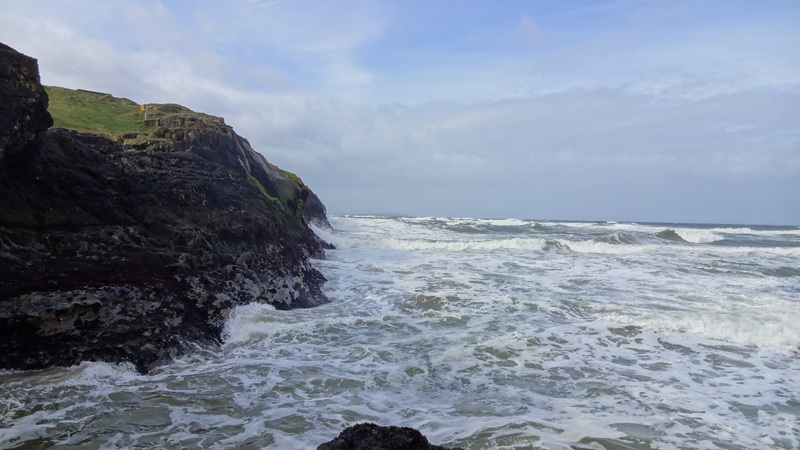 All along the northwest coast were dotted reminders to American and British planes that Ireland was below and of course was neutral during the World War. The word EIRE was painted onto cliffs by volunteers of nearby Look Out Posts. 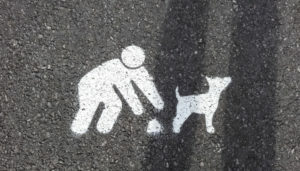 A number of these have been renovated in recent years. The letters were painted at Aughrus Point in 1943. 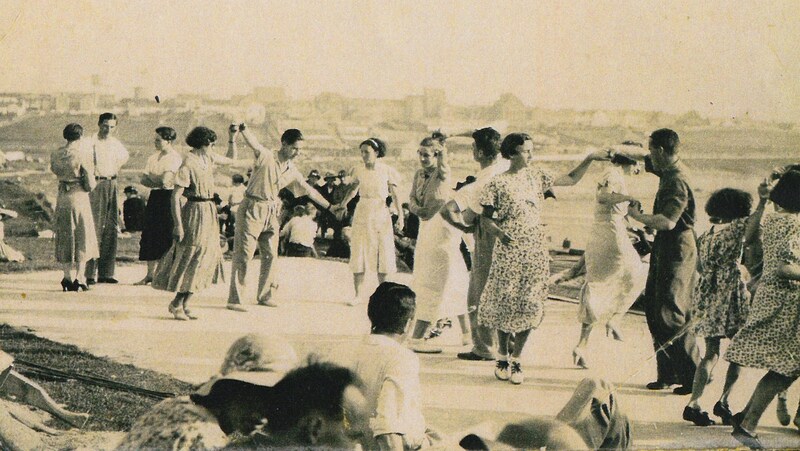 The platform near the shelter was used for dancing during the 1940s and 50s. Groups of ‘comely maidens’ and men would congregate here and dance the ‘Haymakers Jig’ and other such dances on Sunday afternoons during the summer months. This presented the ideal opportunity for the musicians to warm-up for their gig later that night in one of the many dancehalls in the town. A re-enactment in 2015 by the Wessex Morris Men! All along the Roguey Walk, you will find strategically placed ring bouys courtesy of Donegal County Council and Irish Water Safety. 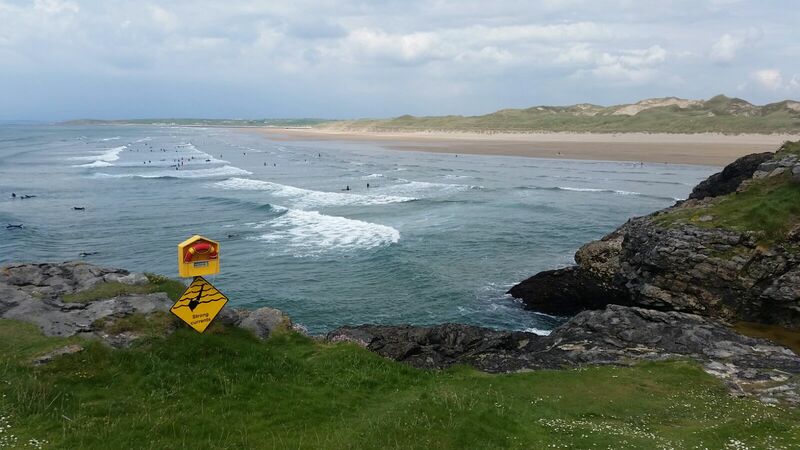 While the sea can provide hours of fun and recreation, it must also be remembered that it is unpredictable with the Irish Coast Guard and the Bundoran RNLI reminding you to always #RespectTheWater. If you see someone in trouble, do not hesitate to call 999 or 112 and ask for the Coast Guard.